Oh, Will Ferrell, how you constantly both amuse and frustrate. 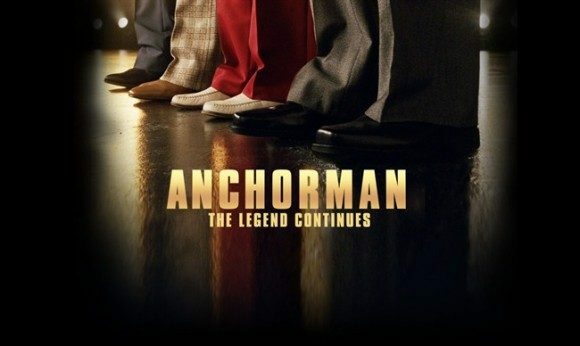 Yes, he’s back with another Anchorman, this one subtitled The Legend Continues. 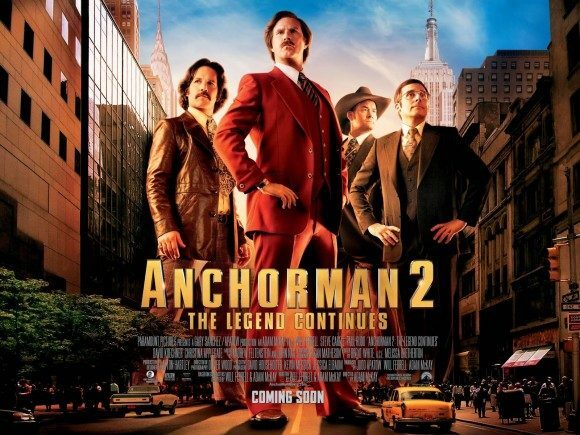 And that’s exactly what Anchorman 2 is: another Anchorman. If you didn’t like the first one, you’re not going to like this one, as it makes the first one look almost reigned in. We’re not quite going into, say, Blades of Glory or Step-Brothers territory here, but this is a pretty gag-heavy, improv-heavy show, and the bits often go for shock-factor-ridiculousness over well crafted humor. But this is Anchorman. What did you expect? Well, to answer my own question, I did expect something that was a little better put together than this film. Plenty of the jokes are at least a little bit funny up front, but they’re nearly all one-off pieces. There’s nothing in the whole film that builds over time, or carries a long setup to a comic end. 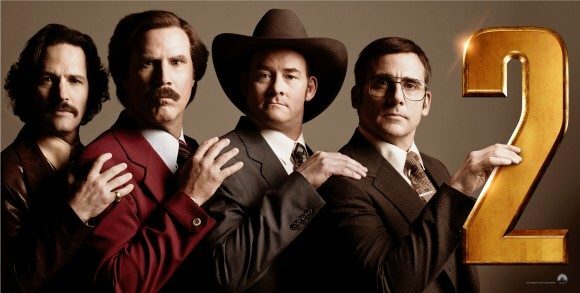 For example, there’s a piece where Ron Burgandy (Ferrell) and his news team of Champ Kind (David Koechner), Brian Fantana (Paul Rudd), and Brick Tamland (Steve Carell) all get perms, but the entirety of the joke’s payoff is a single shot where the four have permed, curly hair. They don’t even keep the hairdos in next scene, so no character ever comments on it and the joke disappears as a single-shot visual gag. This is especially true of the movie’s numerous callbacks to its predecessor. Easily half of the jokes are pointing back to Anchorman and saying, “Remember in the first movie? Remember when we made this joke? That was funny, right?” This strategy might have worked well if Anchorman 2 had added a new layer of funny to each reference, but again, it’s never really thinking that far ahead. There’s one scene late in the movie that stands in stark exception to this norm, beautifully employing a callback to a feature of the first film and expanding it into something new and even more exciting. I won’t spoil what it is here, but it’s definitely a good one. It feels like a lot of the issues at play with the humor come from an over-reliance on improvisation. I don’t know for sure how much of the movie was improv-ed, but there’s a clear difference in quality between scenes, and even parts of scenes, that clearly have a script and those that are working from what’s apparently a rather vague framework. The entire first act of the film is a train wreck mainly because it’s a hodgepodge of poorly cut together randomness and barely does anything to set up a narrative or thematic backbone for the rest of the movie. This may be a comedy, but this kind of stuff is still important. Think about a movie like The Hangover. Zack Galifianakis was definitely given room to improv at times, but the movie had a narrative and thematic structure. It had planned jokes that paid off multiple times over the course of the film. Anchorman 2 is almost entirely devoid of any such foresight. The narrative, where there is one, concerns Ron and his team reuniting to join the first-ever 24 hour news network. They’re given a cruddy 2:00-5:00am time slot, but to boost ratings they start covering fluff pieces and screeching pro-American rhetoric rather than attempting serious journalism. Never mind that the climax of the first Anchorman involved covering the birth of a baby panda, but we’re meant to take Burgundy and co. as potentially serious journalists who instead start the trend that’s led to the dearth of quality news coverage in the modern era. It’s actually kind of a neat premise (albeit one that comes close to an hour into the picture), but rather than continuing to lampoon the national media Daily Show-style, the movie once again settles for the one-off, “Look at this, aren’t we clever!” and then is content to not bother actually saying anything that might be considered social commentary. No one’s expecting a Will Ferrell comedy to have a lot of social significance, but it would have been nice if the movie had made more of this idea. 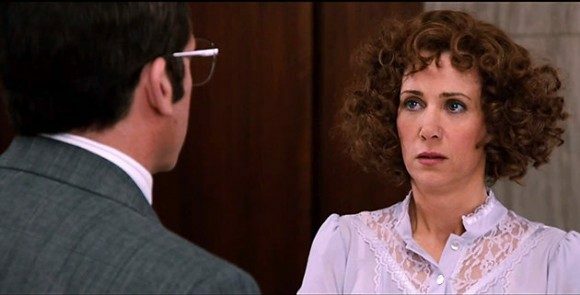 In addition the the aforementioned rather excellent climax which I shall continue not to spoil for those who do see the movie, the best part of the film has to be the subplot with Brick and his similarly mentally impaired love interest Chani, played by Kristen Wiig. Back in 2004 when the first Anchorman released, Carell was still establishing himself. The Office wouldn’t start airing until 2005, which is also when The 40 Year Old Virgin hit theaters. Fast forward back to 2013, and Carell arguably rivals Ferrell in terms of audience draw. As such, Brick’s role is considerably expanded. He and Wiig are very good, and the adolescent nature of their burgeoning affair is hilarious. Not to beat a dead horse, but this is one of the few parts of the film that feels like there was a clear structure in mind, and Carell and Wiig are allowed to go crazy within that context. I’ll readily admit that I respond to clever humor much more readily than stupid humor (and I don’t use that term in a derogatory fashion, simply a descriptive one), so if you loved movies like Napoleon Dynamite or Nacho Libre you may want to take this review with a grain of salt. That said, I thought the original Anchorman hit the sweet spot of being ridiculous and still funny. Anchorman 2 makes the mistake of thinking that pointing back to funny then is sufficient for funny now, and doesn’t bother with much structure to the proceedings. Most of the film falls flat because it’s a collection of jokes that tend tend to rely on shock value absent of any real context or thought. There are funny moments and a couple of good sequences which save the movie from being a total loss, but there’s also a lot of dead air. This is a classic cotton candy movie – looks full and enticing, but upon consumption you realize there’s not much there.